Obsolete is a series of portraits of obsolete Macintosh computers and scavenger birds, painted in a style reminiscent of Renaissance drawings. 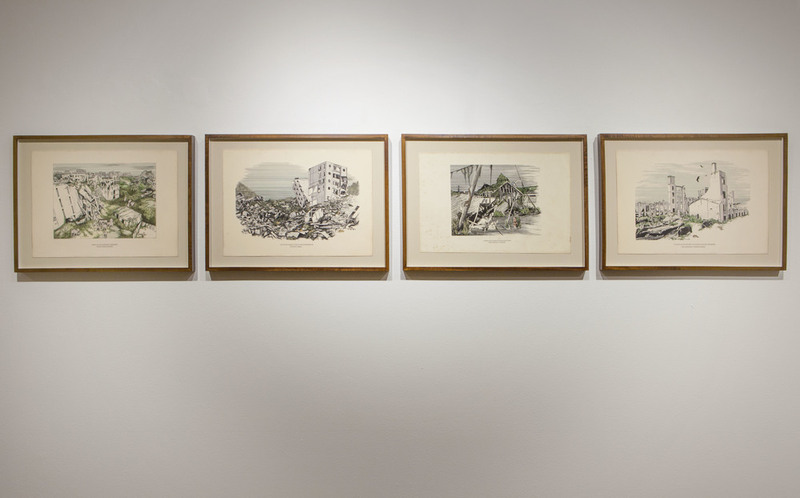 The series of prints, Ruination, references representations of ruins in the Romantic tradition, and taps into our timeless fascination with crumbling civilizations. The prints re-imagine images of recent disasters, suggesting a future in which the sites are given back to nature as wildlife preserves. Each of the sites sit on a continuum between man-made and natural disasters: from the catastrophic loss of life in the collapse of a garment factory in Bangladesh, to the devastation following the breached levies during Hurricane Katrina. Through a painstaking process of rendering the destruction line by line and then rebuilding a space of renewal atop the devastation, the works become not only intimate memorials but also personal acts of catharsis. Although the new images suggest a kind of romantic re-birth, closer inspection reveals new potential for destruction on a scale less striking to the human eye; a destruction perpetrated by nature on itself.